LOWERS LDL CHOLESTEROL! Plant sterols are able to block cholesterol absorption by the intestines, thereby lowering the amount of LDL in the blood. They help maintain a healthy heart! STRENGTHENS YOUR IMMUNITY! Sterols enhance the activity of immune cells & inhibits those causing disease. One study shows they boosted the production of disease-fighting T-cells by 920% in healthy adults! ENJOY OPTIMUM PROSTATE HEALTH! Studies have shown that beta sitosterol can decrease urination frequency, increase peak urinary flow and decrease the volume of urine left in the bladder. PREMIUM QUALITY! Our Plant Sterols are made in the UK in GMP certified facilities. It passed strict tests applied by the government. We’re confident you’ll love it, and offer a 100% money-back guarantee. Lower Your Cholesterol with Earths Design Plant Sterols Maximum Strength 800mg Tablets! They have been proven to Lower Cholesterols by up to 20%! Plant sterols have a similar structure to our own cholesterol. As a result they block the absorption of LDL (bad) cholesterol in our intestines without being absorbed themselves. This lowers the amount of bad cholesterol in the blood. It is well-established that lowering cholesterol levels can have a beneficial effect on heart health, reducing the risk of heart problems. The research surrounding plant sterols is extensive and conclusive. This allows them to carry a health claim stating that plant sterols supplements can reduce the risk of heart disease. 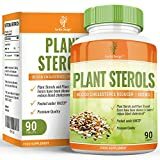 Our High Strength Plant Sterols 800mg are carefully formulated to offer maximum health benefits so you can be sure you are receiving a quality supplement that will help lower cholesterol levels. Start your journey to a Healthier Body. Click on the ADD TO CART button and see it for yourself!